Since I’ve been something of a negative nelly in this series so far, displaying a rich panoply of bad attitudes and an unpleasant irritability, I feel obliged, before saying anything about my previous experiences with Thayer’s work, that this story was a stunning read. And I mean that more literally than is usually intended in literary reviews. I sit here typing, feeling stunned. Now that you know I like the story, I should admit that my expectations were not very high. I bought Hooligan, shortly after it was released, started reading it shortly thereafter, and in three-plus years, I doubt I’ve made it fifty pages. And other Thayer stories I’ve read, I’ve generally appreciated without really liking. It’s a coming-of-age story. It’s boys learning about life. Woo hoo. “Opening Day” is also a coming-of-age story; it’s also about a boy—a newly minted man, rather—learning about life. He’s just returned from his mission (to post-World War II Germany) and thinks that he’s learned what he needed to learn. He has the general scope of his future planned out. One thing he knows for certain, having spent two years in the shadow of death (and the spectre of a possible tour in Vietnam looming over him), is that his boyhood spent killing animals is over. He can never hunt again. Yet he planned his mission such that he would return just in time for deer season. And now he is out in the woods on opening day with his father and a gun and deer all around. The visceral details of the entire hunting process—how to shoot, where to cut, what blood stains remain—lead to a powerful understanding of how much this process defined his life as a boy. And so how, when all his father ever wanted to do was share hunting with his son, will he be able to finally tell his father what he couldn’t tell him in a letter or during the ride home from the airport? How will he make the break? The haunting suspense (will he kill or won’t he?) will feel familiar to anyone who has broken a habit and then found themselves in a situation that demands relapse. But the violence of this particular habit (and the way Thayer finds spiritual under- and overtones to the violence) and it’s connection to fatherly love and familial tradition makes it not just another Thing I Used to Do but an absolute matter of life and death, both spiritually and physically. To get personal for a moment, my mother’s family is all hunters. When my father married in, he tried to go out with the in-laws and kill things, but it never took. And so my cousins would head out the wilderness while I never did. I wasn’t jealous (at all), but hunting held a mystery that was as attractive as it was awful. Reading Fair Chase (an ethics books for hunters) a couple years ago, I came as close to wanting to be a hunter as perhaps I ever will. Certainly it helped me develop an empathy for the hunting drive, while leaving me with my skepticism of those who find joy in the actual killing. I believe Thayer has balanced my needs as well as the needs of a reader with hunting experience, while wrapping his protagonist’s first/last opening day in large Mormon questions. And then the story ends (which ending I will not state here but be warned: people will say whatever they like in the comments) and I was left stunned. No tidy answers. If anything, a new layer of questions. And yet an utterly moving and satisfying conclusion. Enough to wash away any petty complaints I had. But not enough to wash away the complexities of this our fallen world. 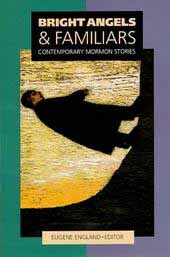 This story is one of my favorite things I’ve read in Mormon literature. You’ve GOT to check out the complete collection, “Under the Cottonwoods,” if you haven’t. I wasn’t a big fan of the one Thayer novel I read (“The Conversion of Jeff Williams”), but those short stories, especially taken all together, are extraordinary. The only Thayer book I’ve read that lives up to Under the Cottonwoods is The Tree House. Powerful stuff–it expands on most of the ideas already present in this story at length. Reading this story again also reminds me of the difficulty of transitioning back from being a missionary to the real world–trying to find your place in your family and your life after you’ve been away for a while. It’s easy to be very idealistic as a missionary and nearly impossible to live up to that idealism when you get home. I just discovered a copy of “Under the Cottonwoods” in my closet. How about that! And it’s free online as well, as it ends up. Hoorah for Signature! Amen to all the good things that have been said about this so far. It’s a powerful and well-written story, illustrating a moral dilemma that is very real for all that it seems to take place on such a small scale. It’s all there: the good resolutions, small compromises, and then the fall. The natural man versus the spiritual. Habit versus resolve. The conflict between social and family expectations and what you feel internally is right. It’s not helped by our sense that if Troy (the POV character) keeps his resolve, inevitably it will create a barrier between him and his family. He is well and truly caught. I’ve never been a particular fan — or critic — of hunting, and it’s not an important part of my family culture. Despite that, this was a difficult story for me to read. Thayer does far too good a job of keeping us suspended at a point of maximum tension, stuck with Troy as the increasingly inevitable ending approaches. I couldn’t read two stories like this in a row.